If you are in the market for a new home, you have probably walked through several different homes in the Panama City area. It can be difficult to choose which house to buy, especially if there are similar options available. Everyone is looking for a deal, but you should be careful because most of the time, the cheapest option is cheap for a reason. If you walk through a home that seems great, is a low price for high square footage, and is located in the perfect spot, you should probably start looking for signs of water damage. The Daystar Cleaning crew is here to help you spot water damage quickly when you are going through a walkthrough. Panama City Homes that have been sitting uninhabited for a while usually will have a somewhat musty smell. But if the home you are looking at has that smell and you can feel the moisture in the air, you should probably be a bit wary. Homeowners who take care of their houses will usually set up a dehumidifier to make sure that the home doesn’t develop water damage, but if there isn’t one set up in the house, you should make sure you investigate. 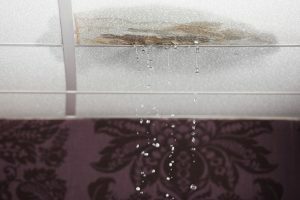 Obviously, during a quick walkthrough, you can’t bust into any walls or move a laundry machine out of the way, but you can look for mildew signs on the walls, ceilings, and flooring. If you see any dark spots that look like mildew or mold, make sure you think critically if the house price will make up for the cost of getting it taken care of. Another dead giveaway that there was water damage in the past is a damaged or patched ceiling. If the ceiling has a gaping hole, then it’s likely that the homeowner isn’t trying to hide anything, but if the ceiling looks like it’s been patched, you should make sure that you have the inspector check that spot thoroughly before you buy. Most ceiling water damage is from a roof leak or from an upper floor bathroom. These problems could range from minor to devastating, so don’t just pass them off as being no big deal. If you’re walking on the flooring and seems to be wavy, then you have a water damage problem. It can be very difficult and expensive to repair wood floors, so make sure you budget that into the offer that you give for the house. You might also notice soft spots or creaks in flooring that has had water damage. These are usually in the bathroom around the toilet or the bathtub, so make sure you don’t just glance in the bathrooms, but you actually go inside and walk around. It is very difficult to tell if water damage is minor or major if you aren’t a professional. The best thing to do is identify water damage when you see it and have a professional from Daystar Cleaning in Panama City check it out.